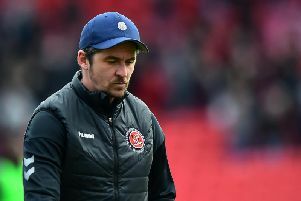 It is a game that will be forever marred by a tunnel incident but this is a game that showed why Fleetwood Town are pretenders rather than promotion contenders like Barnsley. The game at Oakwell was a big lesson as to why this Fleetwood Town crop are not mixing it at the top. From missed chances to defensive errors and a needless red card in another tale of two halves, it was clear why Town are settling for mid-table mediocrity this term. Ash Eastham, Ash Hunter and Ash Nadesan were all restored to the XI after supersub cameos against Southend United last time out. They replaced top scorer Paddy Madden, young Ryan Rydel and Harrison Biggins as Nathan Sheron replaced the injured Jack Sowerby. Lewie Coyle was deployed in a left midfield role and Hunter at left wing-back. Has the 3-5-2 worked in recent weeks? Overall, yes. The formation was a cornerstone of Town’s top-four finish two years ago and was utilised by John Sheridan to keep them up last season. But in Saturday’s first half it left Fleetwood wide open to attacks from a Barnsley side that smelled blood on the flanks and Mamadou Thiam got his eye in early. He outfoxed Wes Burns on the left but his cross was well cleared by Harry Souttar. Town would not heed that warning as Barnsley showed why they are challenging. To compete against the top of the league you need to take chances and defend solidly. 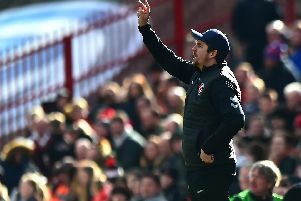 As the half progressed Joey Barton’s side failed in both areas. Nadesan wasted two big chances. He latched on to a long ball over the top but took too much time, allowing Jordan Williams to recover. It was great defending by the Tykes man but poor from Nadesan. Nadesan found himself in the thick of the action again but after leaving Adam Davies stranded way out of his area he failed to hit the target from the right. There was a touch of class as Coyle had a shooting chance from his own short corner but his effort was blocked. Town’s defence was then cut open on the left. Souttar was dragged out of the box as Barnsley’s Jacob Brown got between Hunter and Husband.Mike Bahre found space to fire the cross home from close range in the 24th minute. From then on it was all Barnsley. Burns was forced to clear from under his own bar as Alex Mowatt also went close. Nadesan wasted another chance which Town were to rue. Husband swung and missed in his own box and Cauley Woodrow slid the ball home in the 34th minute. Both opening goals were stoppable. Town’s defence were unable clear and the midfield was not on hand to mop up. Fleetwood will probably end this season with two 20- goal strikers in Ched Evans and Paddy Madden, and with one of the best defensive records in the division. But these avoidable goals showed why they are mid-table and not among the top six. Town were crying out for change and credit to Barton, he did so at the break. The second half showed fight and promise for next year. Barton swapped the 3-5-2 for a 4-3-3, with Burns dropping back to right-back and Ash Hunter moving into the front three. The move paid dividends and it was all Town in the opening exchanges. Evans nodded a Ross Wallace corner over but Town found their bite in the final third when Madden was sent on in the 60th minute. The 18-goal forward has not been in the goals recently. His drought continues but he proved why he should not be benched with a bright cameo that ignited Town’s attack. But Nadesan showed why he has taken so long to get his shot at third tier football. His positioning and pace might be quality but his finishing and decision-making was far from League One. Madden took the game by the scruff of the neck as his pass sent Nadesan through. He had Evans for company on his left and should have squared but his eventual effort was tipped round the post by Davies. The striker had another great chance moments later and again probably should have passed, with Hunter and company queuing in the box. He went for goal from a tight angle, though, and was again thwarted by Davies. But Town got the goal their second-half play deserved as Evans fizzed home Souttar’s knockdown from a Hunter’s corner. But just as Town got themselves back in the game they would shoot themselves in the foot. Souttar was sent off in the 65th minute for an aerial challenge with McGeehan. The big defender simply did not need to lead with his arm and give the referee a decision to make. That decision would infuriate Barton and light the touchpaper for the game’s ugly ending. It also rocked Town’s defence and Barnsley took full advantage. Thiam sprinted into the box and Cairns came out to greet him. The keeper dived at his feet but Thiam rounded him and went on to square to McGeehan, who had an open goal at his mercy. Another avoidable goal. But despite being down to 10-men Fleetwood kept going and Burns made things interesting. He nodded home a Lewie Coyle free-kick to make it eight for the campaign. Burns has been the shining light this season, and after a first half that asked questions of his improved defending he answered them in the second 45 by keeping Town in it. But Barnsley restored that two-goal cushion when Town were temporarily down to nine men. Centre-half Eastham was off the pitch getting treatment and Barnsley made their two extra men pay as Brown rifled the ball through Cairns at the back stick to wrap the game up in the 79th minute. Husband again should and could have done better. Cairns, too, did not cover himself in glory. Another great second half fightback by Town but you just wonder what could have been had they started with a flat back four. Town deserved more for their second half performance but Souttar’s red card put the brakes on any revival. Again, as with the Southend game, the second half showed this Town team are capable of challenging. But a lot of ironing out needs to be done this summer as we watch the team evolve, with this season’s play-off hopes now dead. In these final games we need to see improvements in midfield, a back four, Madden given the chance to hit the 20 and no more stupid errors. The season might have ended at Barnsley but you feel this is just the beginning for this Barton side.